Srinagar, Mar 7, : “Arbitrary arrest and detention of senior resistance leader and chairman JKLF Muhammad Yasin Malik and many others under draconian PSA and shifting of Yasin Malik to Kot-balwal jail Jammu is the most condemnable act of the so-called rulers. This spree of arrests, ban on Jamat-i-Islami and attempts to tinker with hereditary state subject law under the pretext of 35 A and Intimidating NIA raids on Kashmiris deserves our stiff protest and resistance and people of Kashmir besides holding peaceful protests after Friday prayers will also observe a complete and comprehensive shutdown tomorrow on 8th March 2019,” this was stated by joint resistance leadership (JRL) comprising of Syed Ali Shah Geelani, Mirwaiz Muhammad Umar Farooq and JKLF in a joint press release issued today. Terming the spree of arrests, shifting of Inmates to jails outside Kashmir, Ban on Jamat-I-Islami J&K, attempts to tinker with the hereditary state subject law under pretext of 35A and other oppressive measures unleashed in Kashmir as dictatorial, JRL said that today senior resistance leader and chairman of JKLF has been slapped with draconian PSA and shifted to Kot-Balwal jail Jammu. In similar manners spokesman of Jamat-I-Islami advocate, Zahid Ali and many others have been booked under PSA and shifted to different jails. JRL said that these arbitrary arrests and detentions can not deter resistance leaders and activists and the people of Jammu Kashmir from pursuing the path of resistance. JRL said that JRL incarcerated leader Muhammad Yasin Malik is a known heart patient who is suffering from many more ailments too. Callous and dictatorial mindset and approach of police and civil administration is such that they did not allow a leader of Muhammad Yasin Malik’s stature to meet his ailing mother and other family members and shifted him to Jammu in ruinous conditions. 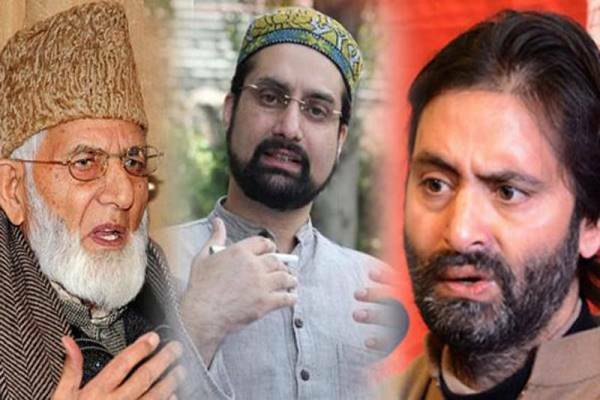 JRL said that spree of arrests, booking young and old under PSA, shifting them to outside valley jails, banning of socio/religious organization Jamat-I-Islami, arresting its leadership and activists ,attempts to fiddle with the hereditary state subject law under the pretext of 35A and intimidating NIA raids against Kashmiris are all evil designs of occupation that are actually an attempt to suppress Kashmiri voices for freedom and thus deserve our stiff resistance and protest .JRL appealed people of Jammu Kashmir to observe a complete shut-down on Friday 8th March 2019, against these evil designs and oppression unleashed by India. Besides this complete shutdown, people will hold a peaceful protest after Friday prayers against all these oppressive tactics. Condemning the mysterious blast at Jammu bus stand that besides injuring dozens of unarmed civilians has also taken the life of a civilian, JRL said that attacks on unarmed civilians are the most reproachful act which should be condemned by all civilized humans. While praying for the speedy recovery of those injured in today’s blast, JRL said that our hearts go to those families whose kith and kin have lost their lives or got injuries in this blast and we express our solidarity with these families. Terming the attacks on Kashmiris in Lucknow UP India by some fascist goons, JRL said that attacks on Kashmiri traders, employees, labor and students have not receded but are increasing at an alarming pace. JRL condemns these attacks on Kashmiris and terms these as most obnoxious.